Police are appealing for information after a man was stabbed in Glasgow’s Merchant City on Thursday December 15. 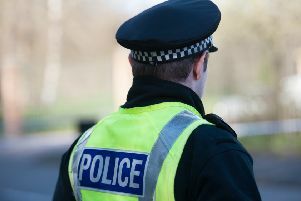 Around 2040 hours last night, a 31 year old man was attacked and stabbed by a man in Albion St, Glasgow. He was taken by ambulance to the Glasgow Royal Infirmary where he remains for treatment. Medical staff describe his condition as stable. The suspect is described as male, of Asian appearance, slim build and wearing all black clothing including a black baseball cap. “We believe that this was a targeted attack on the man. He had just come out of a bar on Albion St, where he was followed by three men in a dark coloured Vauxhall Zafira. Two of the men got out of the car and as he was running along Albion St towards Ingram St, one of the men grabbed and stabbed him. “The suspects then got back into the car which drove off towards Blackfriars St.
“Albion St was very busy last night with lots of people in the area that may have witnessed the incident. So far only a couple of witnesses have come forward, however, it’s possible that others may have perceived this to be a drunken disturbance and thought nothing of it.